Well it's a bit of a melancholy day for me. Here on the Blog I have mentioned a place I play at as well called Google Plus. It is the first Social Media site I had ever belonged to and I met some great photographers over there and gained some great inspiration from them. 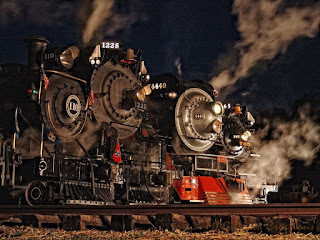 One of the things I got to do was co-host a theme called Steamy Sunday and it was a great time since I like trains so much and people mostly shared images of steam trains around the world and also some other neat steamy things. That's why Sundays here on the Blog have been about steam trains for the most part. Today is the last Steamy Sunday on the Plus because Google, in their infinite wisdom, chose to drop their social media platform. It all goes away on Tuesday so all of us there have been finding other places to play and keep in touch. So anyway, my image for the last Steamy Sunday on the Plus is this one from a night shoot in Michigan several years back. I thought it fitting as the Plus goes dark. This is a really great shot. What a cool opportunity to catch all of these steam locomotives together. It was a fantastic time. Thanks very much Tom!